Our family hosted a 90th birthday party for my grandmother at her assisted living home. Invitations were printed with a colorized black and white photo taken when she was a young woman, and were sent to residents and other friends and family. The event was held in the dining room, with a guest book and a basket for cards as guests entered. The centerpiece for each table was a wrapped gift, with glitter sprinkled over the tablecloth. The gift wrap for each gift was made on the computer with Photoshop, a color printer, and 11x17 paper. Each table's centerpiece was wrapped in a different giftwrap design, each featuring photos from a different decade of my grandmother's life. For example, from 1916-1929, there were pictures of Babe Ruth, Mary Pickford, suffragists, and newspaper headlines about Prohibition and the Stock Market Crash. In the 70s, it was Archie Bunker, Richard Nixon, Rocky, and Saturday Night Fever. Pictures of my grandmother during those decades were also included. To match the party colors of turquoise and chocolate brown, the photos were done in sepia tones, with a turquoise bow on top. At the end of the party, the boxes were given away as door prizes. Each contained a small gift such as hand lotion or chocolate covered cherries. Music from my grandmother's youth was played in the background throughout the party. When the residents were gathered at the dining tables, we began a game of bingo, but not the traditional version. We made bingo cards on the computer, and instead of numbers and the word Bingo, each square was filled with a different color or a simple clip art picture (a birthday cake, a gift, etc.). We tried to make these larger- than-normal bingo cards to help those with vision impairments, and we used large lima beans as markers to make it easier for those with arthritis. We also stationed family members and younger guests at tables to help residents with hearing and memory loss. Then, we drew slips of paper from a bag, each one with a different phrase on it. Some related to personal characteristics of the residents (e.g., worked in a factory, lived on a farm), others related more to life in our hometown (e.g., swam in Moore's Creek, got mad at Terrell Whaley on his radio morning show), and some more related to their era (e.g., remember watching the first man walk on the moon). From a second bag we pulled a color or picture from the bingo cards, and then we announced, If you ever rode on the nickel bus, cover the red square. As people bingoed we handed out prizes, and did not clear the cards before starting the next round. After bingo, the guests were served from an elegant buffet prepared by my sister, a professional caterer and baker. She used my grandmother's antique crystal punchbowl to anchor one end of the buffet table, and on the other was a beautiful 3-tiered cake with turquoise frosting, chocolate decorations, and a large chocolate bow on top (no candles per my grandmother's request.) Much of the rest of the afternoon was spent visiting and eating. A tribute to my grandmother was also on the agenda. At the end of the party, each resident received a favor bag. While they were thrilled with the gifts inside, what meant the most to them was a book my sister-in-law had put together. 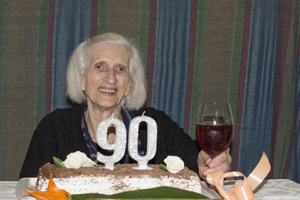 Prior to the party, she had visited the facility and interviewed and taken photos of each resident. She then made the book with a page for each resident, featuring their photo and the stories they had told her. The residents were still reading their books when we left that afternoon after clean-up, and the rest of us have enjoyed reading their stories since. My grandmother said she was sure we'd be invited back, since it was the best party they'd ever had. And as a child of the Depression, she shared that it was the only birthday party she'd ever had.